One of the major criticisms patient's level against most doctors is that they are cold and impersonal , and do not seem to care for them. I don't think this is true , because most doctors take up medicine because they want to help other people. However, it is possible that sometimes doctors may be so rushed and busy taking care of a large number of patients, that it may appear to patients ( and their family members ) that they are uncaring. Doctors are often focused on their job of taking care of the patient and providing them with good quality medical care - of doing the intellectual rigorous work of making the right diagnosis; sorting through different possibilities ; making sense of the labs; and carrying out the technically demanding procedures properly , that they sometimes forget that they need to put on a little more human face when they talk to their patients. Many doctors underestimate the importance of the human interaction , because they're so focused on honing their technical competencies . This is why a number of very successful world-class hospitals provide empathy training to doctors and nurses . They teach them scripts and acronyms which they need to follow in order to convey to their patients that they care for them as human beings. One criticism of these courses is that we are teaching doctors to be hypocritical – that these courses allows them to merely simulate empathy , rather than actually become empathetic. Let’s not forget that a lot of patients can be hypocritical as well ! How many times have you sat in front of your doctor , nodding your head and appearing to agree with everything he's saying , whereas in your heart of hearts you say – No way am I going to undergo this surgery ! A certain amount of simulation is perfectly natural in any human interaction , and if it helps to improve the doctor-patient relationship, this is all for the best ! This kind of acting can actually be very helpful ! Once you start play acting empathy, sooner or later it becomes a part of your DNA and starts coming naturally to you. It becomes a part of your instinct , even though initially it may have been a role which you had to learn to play . Fake it till you make it is very sensible advise – and it works ! Studies have shown that you do not simply laugh because you are happy – it’s surprisingly equally true that when you laugh , you become happy. 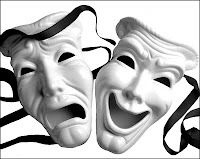 Thus, if you play act well , a lot of these emotions which you have to learn to feel will soon become second nature. Neuroscience has shown that it's easy to fool the brain , which has a hard time differentiating between thoughts and reality ! It is possible to make the heart do what the head tells it to do ! A very important part of the therapeutic effect which a doctor has on a patient’s well-being is his personal presence. We often pooh-pooh this is as being a placebo effect, but the fact remains that the doctor’s bedside manner can make a big difference in how quickly the patient improves. Empathy is an integral part of the doctor’s therapeutic role. Just like we need to teach doctors pharmacology and surgery, so they learn how to use drugs and the knife properly , we need to teach them how to use their personality and personal skills , in order to make their patients better . Isn’t this cheating ? Is it fair to let patients believe that their doctor is feeling compassion and empathy, when he really isn’t ? This is the way all of us learn our habits – both good and bad. Good doctors have been fortunate in that when they were in training, they had great role models whom they could emulate. It’s never too late – and all doctors can be taught to act as compassionate doctors !It's perfectly normal to stimulate feelings; and I think once this is done efficiently, it’ll become a natural part of the doctor’s behavior , so that after a few times he will no longer need to pretent anymore – it’ll just come naturally. After all, most good doctors learn these skills by copying their seniors , who act as role models. Unfortunately , some doctors are never exposed to good role models , as a result of which they never pick up these skills . Tools such as play acting and memorizing scripts can help doctors to acquire these skills. They are critically important , because patients expect doctors to have them ! One of the problems is that it's very hard to measure some of this stuff , because it is intangible. However, they can be judged indirectly. It's easy to measure patient satisfaction scores , and teaching doctors these skills has been shown to improve patient satisfaction scores , which is a very desirable outcome for everyone concerned – both patients and doctors. If doctors can be taught to pretend to care for patients, this is good for patients , because they will feel cared for ; and good for doctors as well, because they will actually start caring ! Empathy has always been considered an essential component of compassionate care, and recent research has shown that its benefits go far beyond the exam room. Greater physician empathy has been associated with fewer medical errors, better patient outcomes and more satisfied patients. It also results in fewer malpractice claims and happier doctors.